Since 1995, the Central Asian Dance Camp has provided opportunities for Americans to study traditional Uzbek, Tajik, Uighur, Afghan and Persian dance with master instructors. The first camps, coordinated by Travis Fontaine Jarrell and Laurel Victoria Gray, took place in Santa Fe, New Mexico, then relocated to Washington, D.C., where they have been held at various locations, including the Embassy of Uzbekistan. 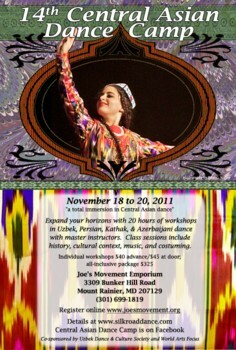 For more information on the Central Asian Dance Camp, check it out on Facebook! basic genres of Uzbek dance, as well as Tajik, Persian, Afghan, Uighur, Turkmen and Azerbaijani choreographies. Class sessions have included history, cultural context, music, and costuming. Students learn the Uzbek “Doire Dars,” a demanding Uzbek dance etude incorporating fundamental elements such as traveling steps, arm movements, turns, as well as shoulder and head movements.